In Juxtaposed, Melbourne based artist Colin Palethorpe considers the Australian landscape as a hybrid space, using the stark nature of collage to evoke an almost alien collision of European ‘settler’ culture on Australian soil. 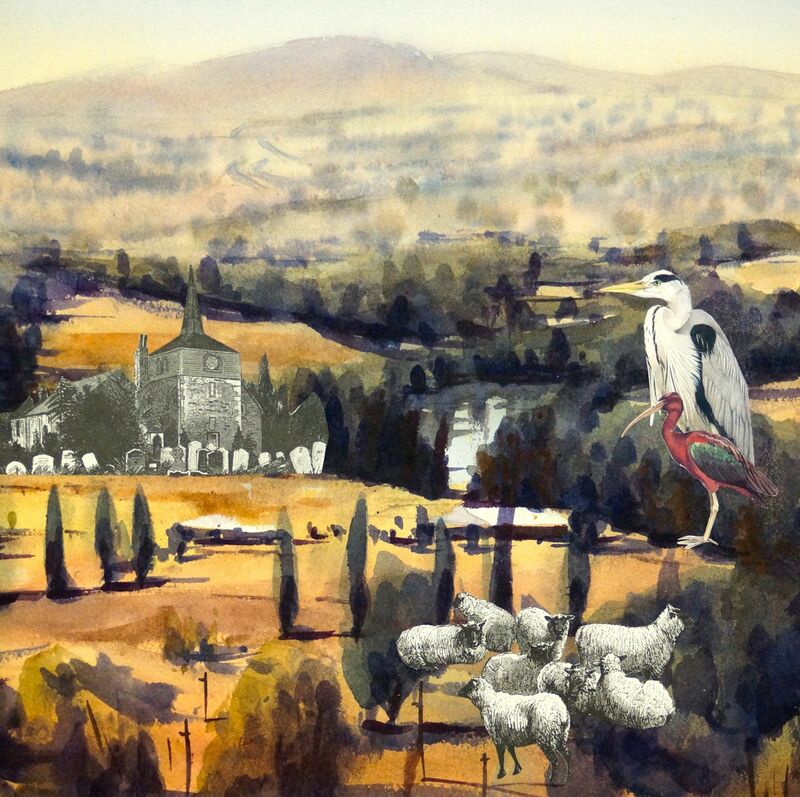 Idyllic pastoral scenes are sensitively rendered on paper, only to be interrupted by foxes, birds, rabbits and various other elements cut out from historic sources, and inserted into the imagery. Out of scale and out of place, they loom larger than life and lend a surreal dimension to the Australian landscape. In this series of 29 works Palethorpe focuses on distinctly colonial views. 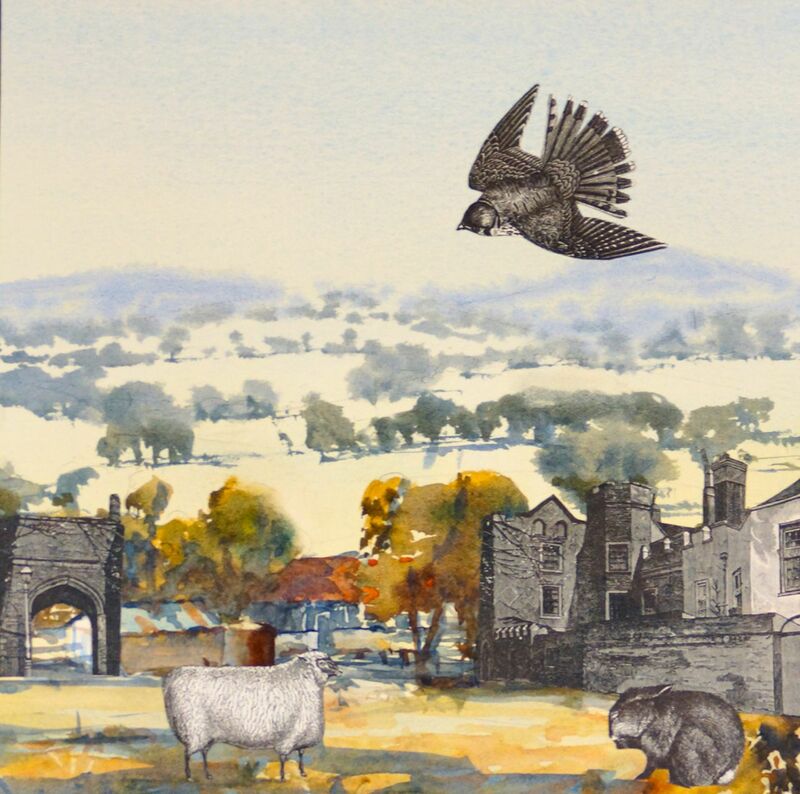 He starts by describing settler cottages in rural locations, using watercolour to depict these humble buildings and their natural environment. Such images relate to how early settlement in Australia was represented in colonial painting, where the landscape becomes a claimed and cultivated space, often tinged with the melancholy of hardships won, yet resonant with a bucolic sense of man and nature in harmony. By evoking a more discordant dichotomy in the context of such imagery, Palethorpe presents a counterpoint to established modes of representation. 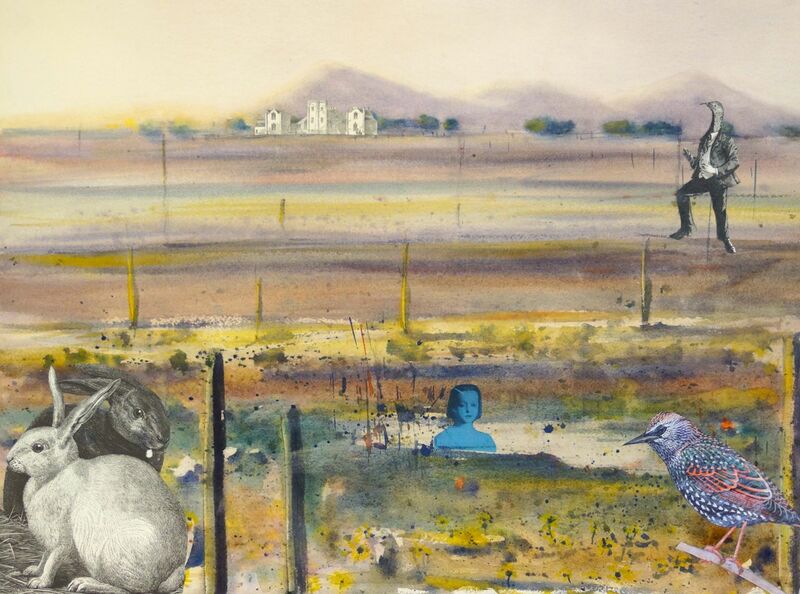 Collage has long existed in Dada and Surrealism as a politically charged medium, and in this body of work Palethorpe employs it to create blunt juxtapositions and a sense of visual play, charting an alternative reality to that presented in traditional colonial artwork. Palethorpe scours op shops for old history books from Britain, and reproductions of early naturalists engravings of flora and fauna. Cutting out various images including animals, buildings and figures, they are subsequently reimagined and reassembled in a new context. 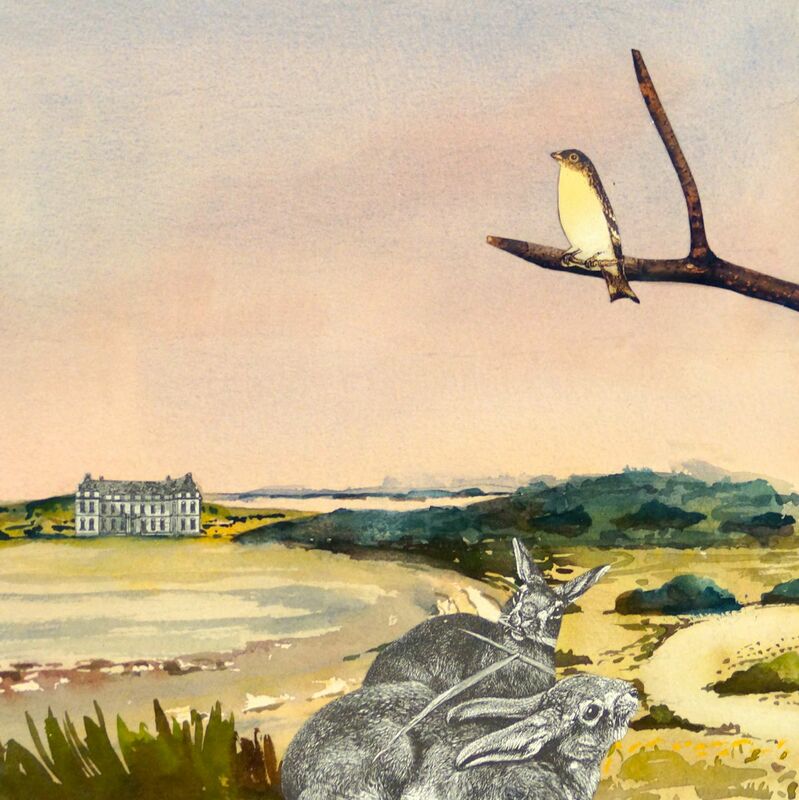 Introduced species that have since become environmental pests, such as foxes and rabbits, gleefully bound through Palethorpe’s works, along with the occasional figure appropriated from Surrealist pioneers such as Max Ernst. These highly detailed forms bear the finely wrought aesthetic of engravings from a pre-digital age. 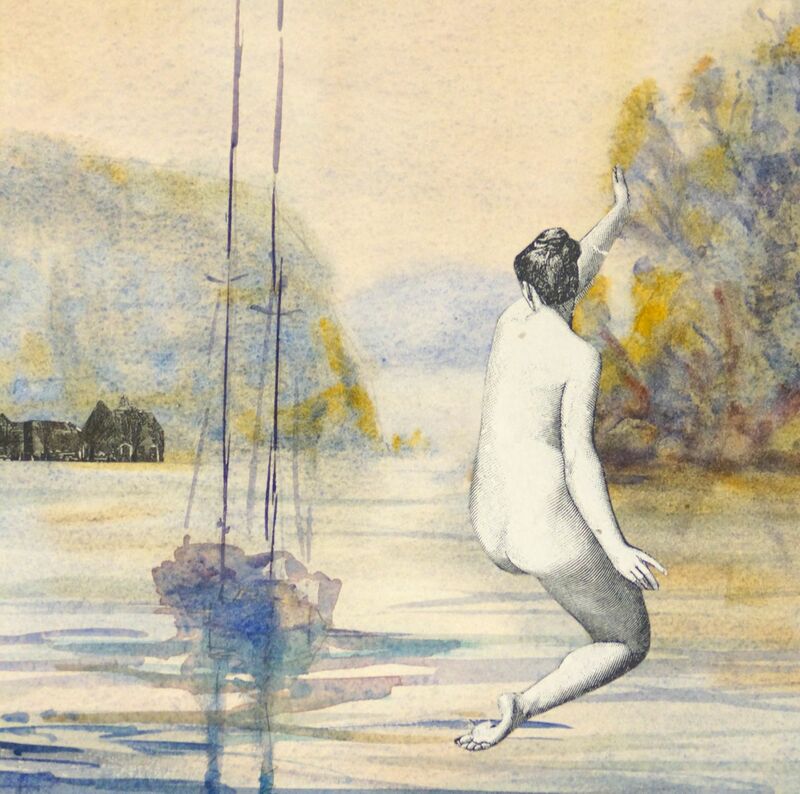 This combined with a loose and painterly application of watercolor creates imagery that is conceptually effective and visually coherent – the sum of its multiple parts. Along with the major collage series, Juxtaposed also features two minor series of small oil paintings, Centralia and Europa, where with glowing colour Palethorpe depicts the very different landscapes of the Australian interior, versus picturesque European locations. 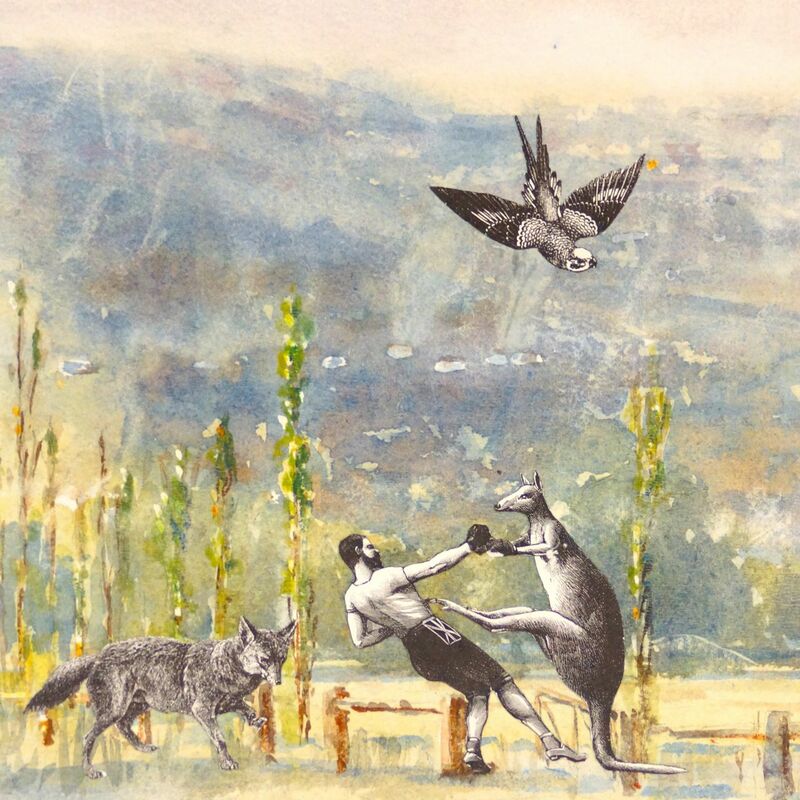 Tags: art, art criticism, Australia, Australian art, Colin Palethorpe, collage, contemporary art, Firestation Print Studio, illustration, landscape, Marguerite Brown, Melbourne, printmaking. Bookmark the permalink.